Google announced quite a few updates about its products at the Google I/O 2011 event, like the release of Angry Birds For Chrome, showing its ability to run games in the browser. A number of changes have been made to the web version of Android Market. Google also revealed some amazing stats that demonstrate the growth of the Android platform. The Android Market has quite literally exploded – it has over 200,000 apps supporting over 300 Android devices and the installations exceeding 4.5 billion applications to date. This rate of expansion makes it very difficult to keep a track of the best of apps in the Android Market. To make this task easier, a better system of app suggestions was required and Google has introduced a few new options for locating the apps you require. The new features help exploring new apps in the Android Market quite easy. These features aim at bringing the latest, greatest and the evergreen apps to the user. The charts are revised and are made to be country specific. No more browsing apps that you cannot download/use! The Top App lists have 5 top apps in each of the sections in the left side column of the market. A section of apps chosen by the Android Market staff. Covering all the sections in the market, Editors Choice offers a variety of handpicked excellent Apps. As a sign that Google appreciates the developers that create excellent apps for the Android platform, a small blue icon now displays with the name of the developer branded as ‘A Top Developer’. 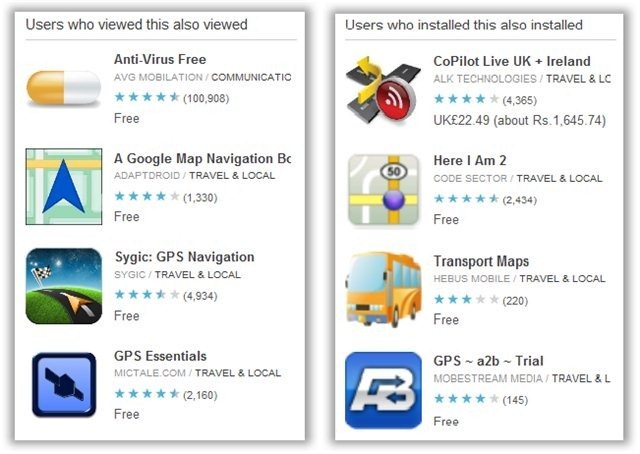 Apps frequently browsed by people who viewed this app. Apps that people tend to install alongside this app. The above screenshot shows the app suggestions for Google Maps. Apps that are growing fast in terms of number of installs. See this section to know what is up and hot! These new features are sure to improve the way we search for apps on the Android Market. This is a nice update to the market and we look forward to more such steps to improve the Android market experience. Right now, these new features are available only on http://market.android.com and will be coming soon to Android Market on phones and tablets.